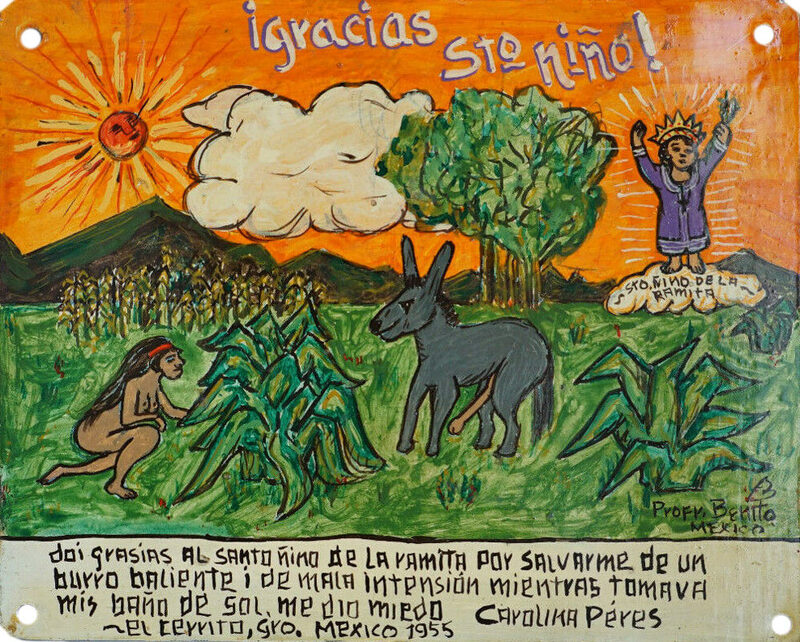 I thank the Holy Child with the Twig for saving me from an angry donkey that had bad intentions and scared me when I was taking a sunbath. I thank the Merciful Lord who wouldn’t let me die freezing on my way to USA where I went for a job but got caught in a blizzard. Her son was 1 year and 13 days old and he got sick. No remedy, no natural medicine would help him. So she went to the Lord of the Column’s altar and asked a glass of holy water. She pour some of it in the baby’s mouth since he was already facing death. 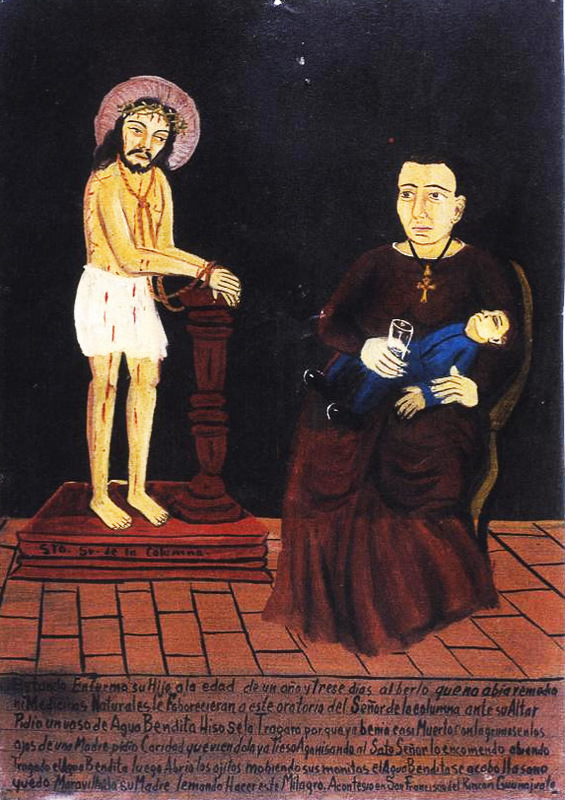 With the tears in her eyes, the mother asked for a favor and entrusted the dying child to the Lord while keeping pouring the holy water in him. Suddenly the baby woke up and moved his little hands. Holy water healed him. 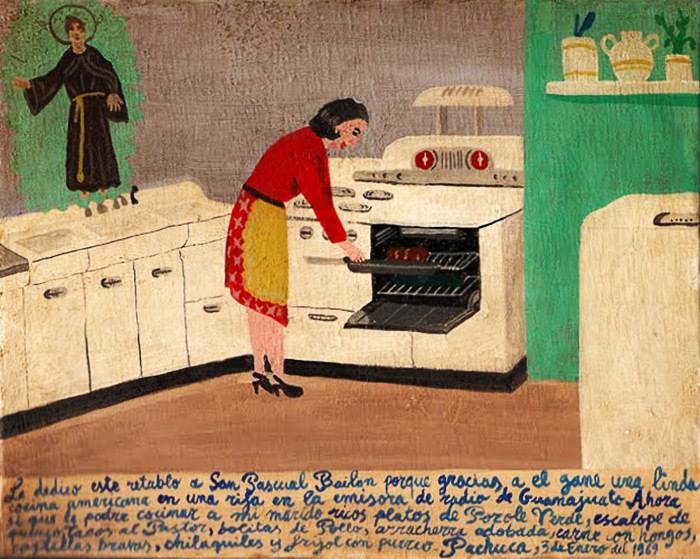 The mother brings this retablo as gratitude. My rooster El Dorado came out from a fight badly injured and couldn’t heal. I prayed Saint Anthony the Great to make a miracle of healing my rooster, and few days after it was recovered. 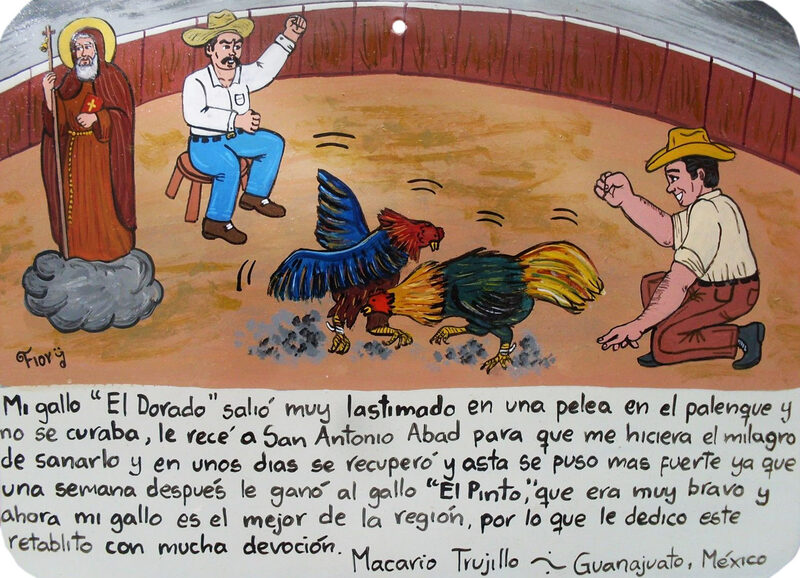 My rooster became even stronger than ever and the week after won over El Pinto, which was a very fierce rooster. 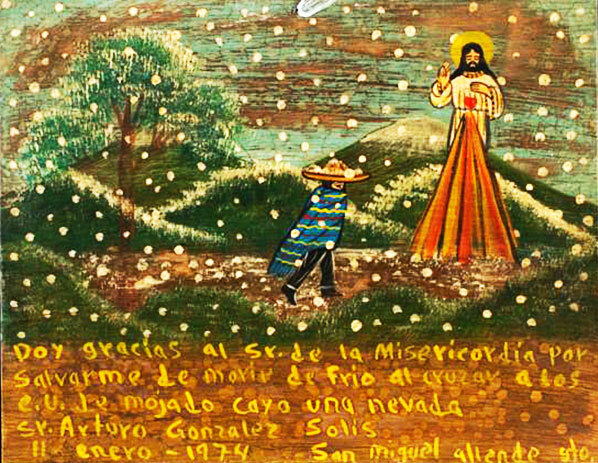 Now my roster is the best in the region, and I dedicate this retablo for that, with devotion. 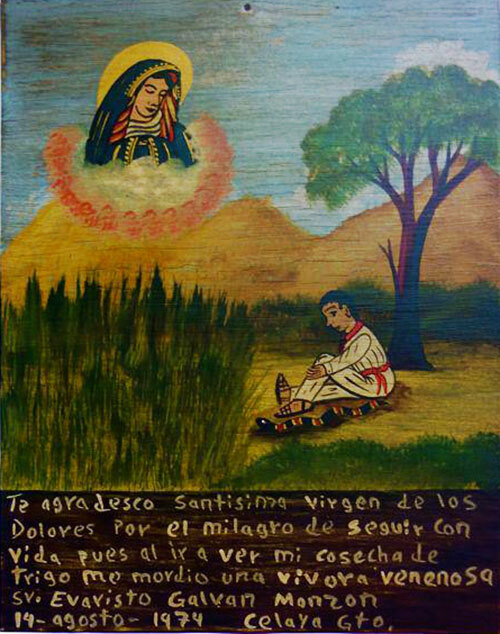 Thank you, Virgin of Sorrows, for the miracle that I’m alive. I went to see my wheat crops and a viper bit me. 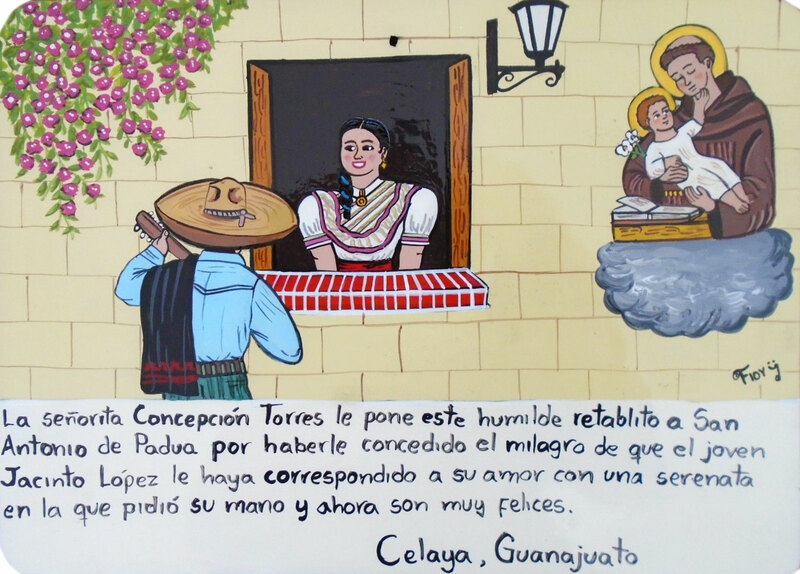 Miss Concepción Torres brings this humble retablo to Saint Anthony of Padua for the miracle that the young Jasinto Lopez has responded to her love with a serenade in which he asked for her hand. Now they are very happy together. 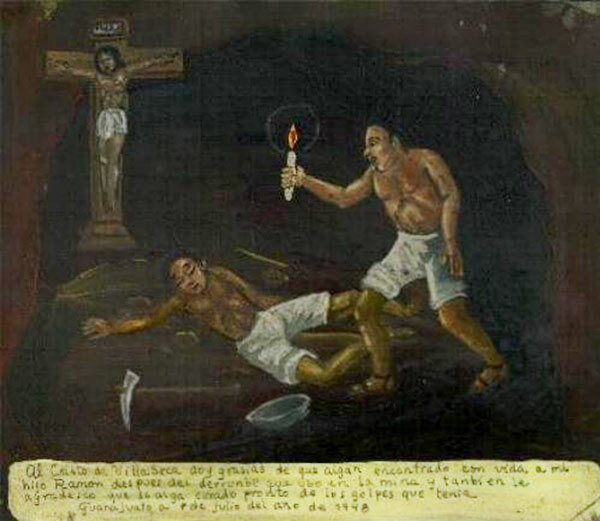 I thank the Lord of Villaseca for I found my son Ramon after the mine had been collapsed. I also thank because he recovered quickly after that accident. 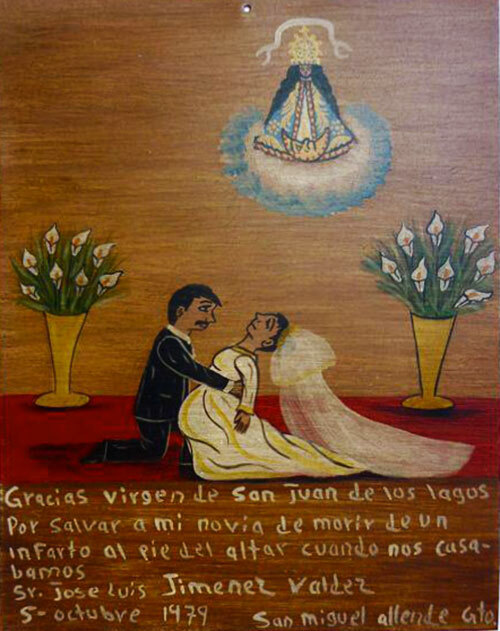 I thank the Virgin of San Juan for saving my fiancée from dying from a heart attack right at the altar during our wedding. 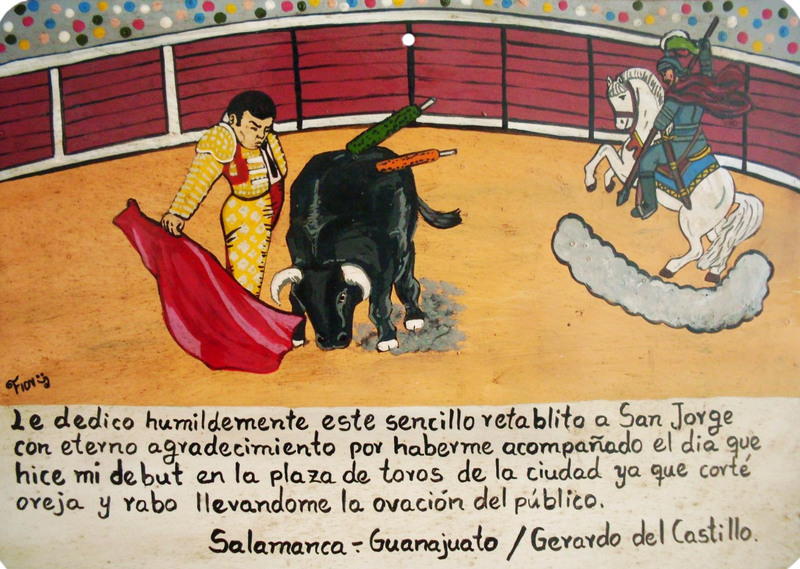 I humbly dedicate this simple retablo to Saint George with my eternal gratitude for being with me on the day of my debut at the town bullring. I performed splendidly and received an ovation from the audience. 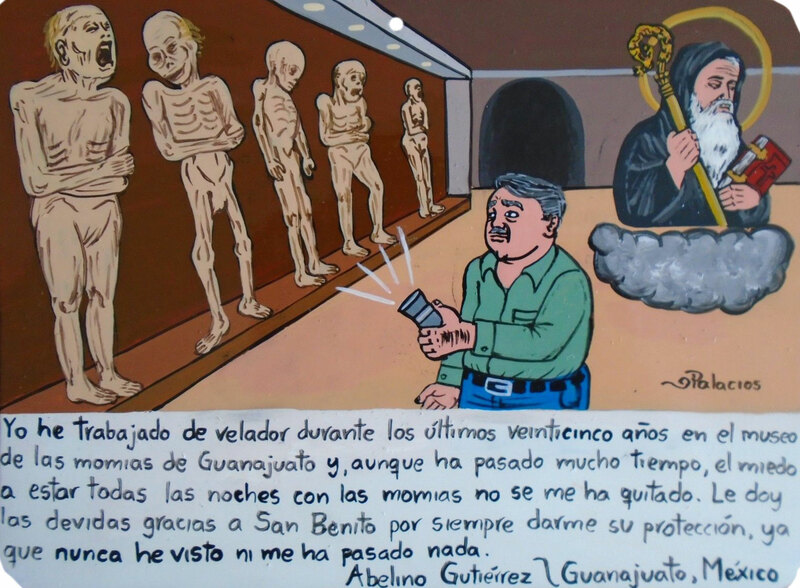 My husband and I were spending a night in an inn in Guanajuato to celebrate our anniversary, and it happened that the Death appeared to us. We were very frightened and prayed to the Virgin of San Juan. 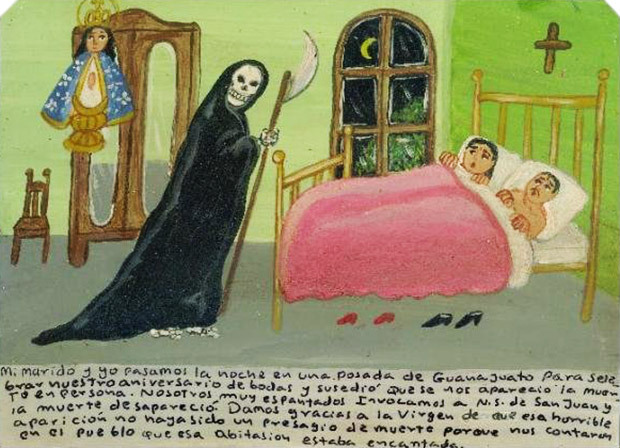 The Death disappeared. We thank the Holy Virgin for this horrible apparition didn’t make a deadly omen to us because we were told in the town that this room was bewitched. *** Vargas and his wife Evarista Ramirez almost turned their toes up when their friend Macarias put on a skeleton outfit, got in the mask shop and yelled at them.